Hey Kids. This is advertising! 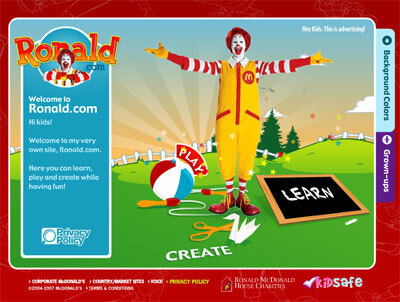 Visit Ronald.com (as in Ronald McDonald the McDonalds character) and in the top right you’ll see this phrase. Hang on wait. How can you expect kids to understand that? You’re right they can’t. If you run a reading score on that it puts the reading level at 13-15 (Flesch Reading Ease 68.94). Browse the site, it’s definitely aimed at younger kids. Much younger, more 5-10. Come on McDonalds… if you need to say it’s advertising you’ve definitely crossed the line, and you’ve even crossed the line in a capacity that even your audience aren’t fully aware they’re being marketed to….shame. This entry was posted on Monday, June 28th, 2010 at 5:22 pm.